Shropshire County Cricket Club has agreed a deal with Hawk Cricket to wear the company’s playing and training kit for the next two seasons. The partnership will also allow Shropshire’s first team squad, together with up and coming players in the county’s Development XI, to receive significant discounts for cricket equipment from Hawk. The company, based in Worcestershire, are renowned for manufacturing cricket bats from the finest English willow. They also specialise in providing cricket clubs with all the equipment and kit, including leisure wear, which cricketers need. 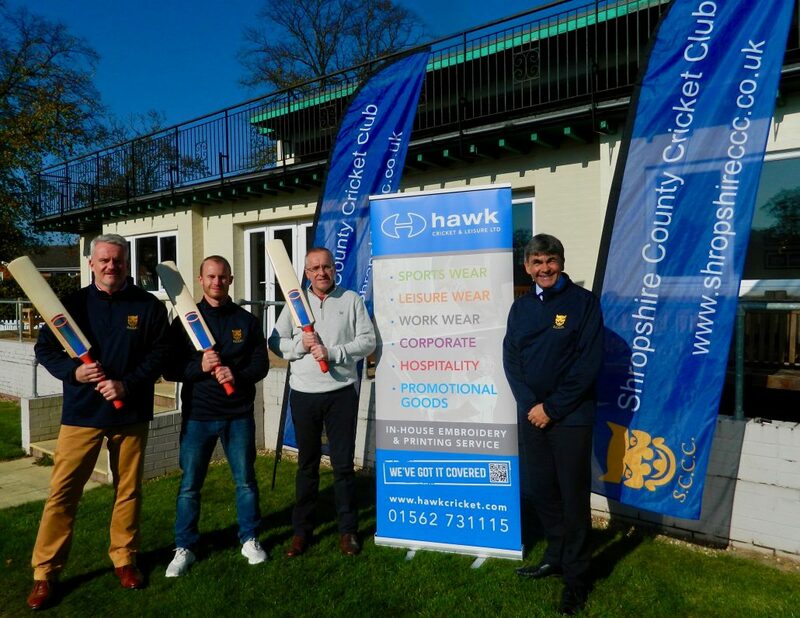 Toby Shaw, the Shropshire CCC chairman, said: “We’ve formed a closer relationship with Hawk Cricket over recent years and have been very impressed with the service and the quality of the clothing provided, so we are very excited about having this opportunity to work with them. “Our players will have access to Hawk’s full range, so it is a great opportunity for them. Hawk Cricket sponsor Alexei Kervezee, the former Worcestershire star who topped Shropshire’s batting averages during the 2018 season, his first campaign with the club. Now Mike Hawk, who established Hawk Cricket with his brother Robert in 1996, is looking forward to further strengthening the company’s relationship with Shropshire CCC. He said: “We’ve dealt with the club previously but to sign a contract to supply the goods for Shropshire is fantastic. “We work with lots of schools and cricket clubs, but this will be the first county cricket club, so these are great times for us. Pictured from left: Ian Roe, Shropshire’s Development XI coach, Shropshire player Alexei Kervezee, Mike Hawk from Hawk Cricket and Toby Shaw, the chairman of Shropshire CCC.